Tales from the Real OC (Really! ): ECHO!!! 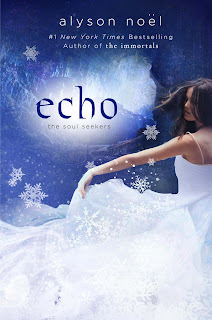 The release of ECHO is just over a month away now (11.13.12!) and I can’t wait to share this next installment of Daire’s story with you! The early reviews are already starting to come in and I’m excited to share that Night Owl Reviews named the book a Top Pick and gave it 4.5 stars!!! "Daire and her boyfriend Dace are back to restore the balance of good and evil after saving her grandmother and her soul. Dace is deliciously yummy, and if I say so myself, so is his evil brother Cade. It's a bit more fast paced than Fated was, and it's setting up the series to have longevity. If only it wasn't so long again until the next installment!" 4.5 Stars—Top Pick! And, in the meantime, don’t forget you can stop by the official Soul Seekers site at http://www.soulseekersseries.com/ to find your spirit animal, build your own dream catcher, and more! Win a Signed Copy of EVERMORE!! !